Miss Anna Hinshaw, teacher in Wilmington Public School for many years, quietly observed her 93rd birthday anniversary Wednesday at her residence on Columbus Street. No celebration was planned but Miss Hinshaw received cards and greetings and several bouquets of beautiful flowers from her friends. Mrs. H.C. Thatcher and Mrs. Nellie Madden, neighbors, and Mrs. Burch Williams, her niece, and Mr. Williams called during the day. Adding special pleasure to the day for Miss Hinshaw were long distance calls from Mrs. Willaim Stanton of Miamisburg, Herbert Painter, Miss Hinshaw's nephew, of Philadelphia, and her niece, Mrs. Helen Painter Frazier of Dayton. Miss Anna Hinshaw, 94, of 31 Columbus St., died Thursday at 11:30 p.m. at Hale Hospital. She had been failing in health and hospitalized since May 14 when she fell at her home, fracturing her left hip and arm. A teacher in Wilmington and Clinton county schools for 45 years, Miss Hinshaw is remembered kindly by a large number of persons, who attended her classes, and who were influenced by her fine principals of life and living. She started her teaching career at Mt. Pleasant rural school at the age of 16 years and retired after many years in the seventh grade at Main school building in the city. The daughter of Garner and Maria Hockett Hinshaw, she was born Jan. 2, 1864 at Westboro, where she spent her childhood days. She was a birthright member of the Friends Church and devoted to its services as long as her health permitted. Funeral services will be held Monday at 2 p.m. at Reynolds funeral home, in charge of Dr. A. Ward Applegate, and interment will be in Sugar Grove cemetery. Friends may call at the funeral home Sunday from 2 to 5 and from 7 to 9 p.m.
"Ohio Death Index 1958-1967" (www.ancestry.com). Anna Hinshaw's obituary, Wilmington (Ohio) daily newspaper, May, 1958. Anna Hinshaw's biography, Wilmington (Ohio) daily newspaper, Jan 2 1956. 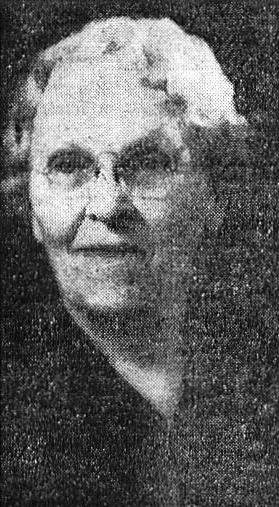 Anna Hinshaw's biography, Wilmington (Ohio) daily newspaper, Jan 3 1957.